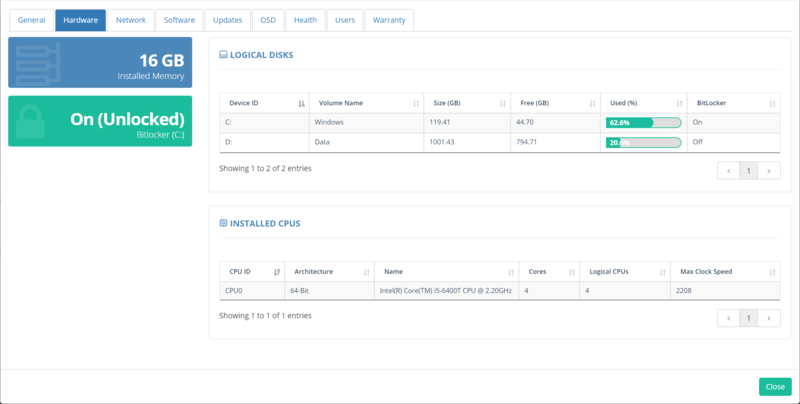 The Callisto Device Modal shows data for a selected device from across the Configuration Manager data set. The modal features several tabs to provide detail on specific areas. The modal opens with focus on the most relevant tab for the originating page, for example clicking a device in the Operating System Deployment page opens the modal on the OSD tab. High-level detail of basic properties from discovery data and the Operating System, System Enclosure and Computer System Product classes. We also allow for Lenovo storing their serial numbers differently and will pull that from the PC BIOS class where appropriate. The collection membership for the device is shown with a count of collection members. Clicking collection provides a view of the collection members. The Installed Memory count is calculated by counting the physically installed DIMMs and their capacity. This provides a better view of the memory capacity of the device than the Total Physical Memory property of the Configuration Manager Memory class. We also show the logical disks in the machine, their space utilisation and their BitLocker encryption status. If the BitLocker data is unavailable, please see this article to enable inventory of BitLocker status. We also display processor detail from the Processor class. Basic network information for any NIC in the device with an IP Address. Callisto shows the data stored in 32 and 64 bit Add/Remote Programs software inventory. This is searchable and can be exported. The left pane shows software metering data for all apps with metering rules executed on this machine. Each user who has run a metered program will have an entry here. Software metering data is summarized in Configuration Manager, which can introduce significant delay in execution history being presented, so we also provide the right hand table of recently used application data for all applications with a metering rule, this inventory class does not rely on summarization. 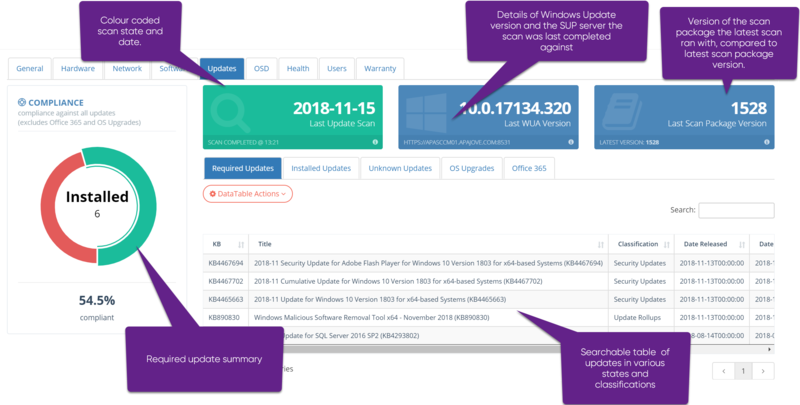 One of the most useful tabs in the Device Modal, the Updates view is data-dense and provides visibility of update compliance for a machine not easily found the ConfigMgr console. When a device looks like this example, the scan data is green as the scan is recent and was completed using the most recent scan package, this machine will have no Unknown Updates. As the scan data ages, the status will change colour to amber and red, and the number of updates included in the scan package that we do not have status for will increase, so the number of unknown updates will grow. Clicking any update in the table will open the Update Modal for full information on that update and its deployment status. If the device was imaged using Configuration Manager, details of the Task Sequence used to deploy it and task-level data about the execution of the task sequence are shown in the OSD tab. The colour coded icons in the first column help with identifying where errors may have occurred. Clicking any task will display the detail text behind each action if available. The client health tab summarizes client communications and configuration. View when the client last submitted data and accessed the infrastructure. Callisto will list the console users and device affinity data for the device. Number of logons is also shown. Where a device is manufactured by Dell, HP, Lenovo or Toshiba, Callisto can interrogate the warranty service to pull the details for the machine.